Collapsible C creaked in the davits, jolted suddenly; and another snivelling complement began the descent. The last descent, as far as the man standing opposite could see. He was holding to a desolate deck - no matter how populated - which had just become the very threshold of life and death. The moment was fleeing. He hesitated as the bobble of heads met his feet and headed lower. He who hesitates further in this event is assuredly lost. Bruce Ismay buckled; slipped his slippered feet over the side, and dropped free. In an instant he was sharing the communion of the saved. An event is such a little piece of time-and-space you can mail it through the slotted eye of a cat. A surge of relief was passing through Ismay’s frame. As the craft reached the supportive slap of water, he was buoyed anew and grateful in casting off. And then one hand on flimsy canvas side told him something else. That the skin of safety need not have been this thin. Axel Welin he had met. The davit-designer proclaimed its ingenuity: They can take more boats. The regulations will be changed. It is sensible to be ready. But the regulations had not yet been changed, and so they had made do with the davits themselves and occasional collapsibles. The very word now mocked him – collapsible. He, the head of the White Star Line, travelling to see what improvements could be wrought for the Gigantic, swathed in a few strakes and pliable yards of impermeable cloth. Had he not been mindful? He had tried to attend to everything. Consulting chief engineer Bell at Queenstown, concerned about the coal, the need to be off the lightship by five o’clock on Wednesday. Meeting passengers, drawing them out; keeping Smith on his toes – the regular conspiracies with Andrews. A speed run. The full inspection from top to bottom he planned before New York. Within succeeding hours, Ismay became a vacant shell. Mechanically, he climbed the Jacob’s ladder to the teak planks of a competitor. Mumbled through a handshake with a man in command; accepted coffee. Put about for New York? Yes, yes, as you see fit. Was led through a corridor to a large cabin and a bunk. Do not leave me here alone – he seized the steward’s sleeve. A doctor came, and collapsible Ismay met a craved oblivion. Bruce Ismay is under opiate. I do not think it would be wise, the gentle figure, garlanded in gold braid, had added when he came later to Ismay’s room. No, no, he’d agreed. Something about the Olympic… passengers gazing at the vessel of their destruction. And then there was the Gigantic, now building in Belfast, and a whole babble of concerns. The doctor arrived again, redispensed narcotic absolution. Most desirable Titanic crew aboard Carpathia should be returned home earliest moment possible. Suggest you hold Cedric, sailing her daylight Friday unless you see any reason contrary. Propose returning in her myself. Please send outfit of clothes, including shoes, for me to Cedric. Have nothing of my own. Please reply. He arrived in New York, was met aboard by Franklin and Sanderson. Then the bally politicians had barged in, waving papers – and he hadn’t even set foot in the city! By lengths he was escorted to the private car at dockside. Lightning and flashbulbs lit the enfolding gloom. So thankful you are saved, but grieving with you over terrible calamity. Shall sail Saturday to return with you. Florence. The very next day Bruce Ismay was mindful, aye, and to the point. He issued instructions that no ship belonging to the International Mercantile Marine was to leave any port unless she had sufficient boats on board for the accommodation of all passengers and the whole of the crew. Ismay brooked no resistance, reiterating that no ship of the company would henceforth sail from any port unless she had sufficient boats. He conceded to company officials: It may be necessary, and probably will be necessary, to reduce the number of passengers in the cabins. A solution for the short term. Bruce Ismay served his public expiation. New York, Washington - it may as well have been the Garden of Gethsemane. The things they wrote in the yellow press. He wrote to darling Florence, told her not to attempt the Atlantic. He would be far too busy with the Senate Inquiry. But the letters came, daily, letters from friends too. Messages of support behind the desk in the foyer… and then it was all over. Mr Bruce Ismay arrived at Queenstown yesterday on board the Adriatic, and was met by Mrs Ismay. Customs officers and officials of the White Star Line were the only people other than passengers allowed on board. Sir J. Nutting, of Dublin, one of the passengers from New York, said Mr Ismay made no complaint as to the Senatorial inquiry into the Titanic disaster, but he expressed the opinion that some of the American newspapers were unjust to him without waiting to hear what statement he had to make. Mr Ismay seemed to be suffering from nervous strain when he embarked, but his health has improved during the voyage. He kept much to himself, was never seen on the promenade deck, and used the lower deck very little. Meeting Florence was all he needed. The public face of the White Star Line found privacy and a healing well. A day later, on May 12, 1912, the couple arrived in his home city, Liverpool, pleasantly cheered by the applause of a large crowd gathered at the landing stage. Looking pale and haggard, he doffed his bowler hat to the throng and disappeared into another vehicle while a bland prepared statement was distributed to the press. It indicated that he could not be expected to say anything with a domestic Inquiry pending, but acknowledged with a full heart the many messages of sympathy he had received. Bruce Ismay at the US Inquiry, April 23, 1912. He shows a ring on his right little finger, quite separate to the wedding band he wore on his left hand. Liverpool had always been kind to the Ismays. J. Bruce drank this full draught of the city’s support on his return, and reflected on the esteem, nay the adoration, in which the maritime heart of England had perennially held his father, the great Thomas Henry Ismay. His father was loved for his founding of the Liverpool Seamen’s Pension Fund in the last century, the occasion being marked by the presentation to Ismay senior of a silver service and an illuminated address on parchment paper. The Oceanic Steam Navigation Company had also used the inauguration to confer on T.H. Ismay a portrait of himself from the brush of the pre-Raphaelite artist Sir John Everett Millais. Millais himself, Bruce Ismay might have reflected, had also since become a man of the people. He gave the new century one of its first popular icons – the painting entitled Bubbles, whose curly-haired boy blowing gossamer globules had been transformed into a trademark of Pears Soap, the million-selling bathroom requisite whose manufacture was headquartered locally at Port Sunlight. Advertising history, built on a blown kiss! It was a famous success story among Merseyside merchant princes and further afield. The reverie he allowed himself burst as quickly as any soapy sphere. The British Inquiry loomed. But at least he was home. If things had been looking up at Liverpool, Ismay’s hopes were dashed by what he would read in the Inquiry’s final report of July 1912. On the surface it seemed to entirely exonerate him… but why should there be any question in the first place? Ismay could well read what he felt had been artfully writ large between Lord Mersey’s lines. Instead of passing over common tittle-tattle on the manner of his survival, the ill-informed nudge-and-wink of corner gossips, Mersey had actually dignified their skulking suspicions – while appearing to decry that very process. …As to the attack on Mr. Bruce Ismay, it resolved itself into the suggestion that, occupying the position of Managing Director of the Steamship Company, some moral duty was imposed upon him to wait on board until the vessel foundered. I do not agree. Mr. Ismay, after rendering assistance to many passengers, found C collapsible, the last boat on the starboard side, actually being lowered. No other people were there at the time. There was room for him and he jumped in. Had he not jumped in he would merely have added one more life, namely, his own, to the number of those lost. Mersey attached no blame and yet left stigma. He seemed to suggest that Ismay deserved to live, but only by tolerance. Duty had not bade him stay, yet manliness might still have tethered his fate to that of his vessel. Bruce Ismay was damned with faint acquittal. And so began his exile. The distance was first given by others in his social set, and it gained ground with his departure from the White Star Line in 1913. Thereafter J. Bruce Ismay began a personal retreat, one that drew him away from London’s chattering classes, and somehow back to the sea. The truism is that a broken Bruce Ismay never crossed the Atlantic again. It is accurate insofar as it goes, but it clouds the strange hold the Western Ocean held over him until the day he died. His withdrawal from London society coincided with greater investment of time in Ireland. Costelloe Lodge, at Casla (angl. "Costelloe"), Co. Galway, on the edge of the Atlantic. 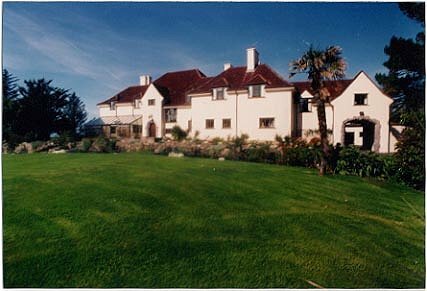 This is the Ismay retreat as it looks today. J. Bruce Ismay bought this house and lands at Casla, Co Galway, in January 1913, in preparation for his retirement later that year from the shipping conglomerate and firm established by his father. Costelloe Lodge would be his sanctuary from all the afflictions that stemmed from the word ‘Titanic.’ The name could never be enunciated within these walls, property in which he would spend much of the next quarter of a century. Perhaps it was aversion therapy, for Costelloe Lodge is on the lapping fringes of the Atlantic. From here westward, the next parish is literally in New York. The lady lifting her lamp beside the golden door might mutely invite the storm-toss’d huddled millions… but Ismay’s twinkling lights beguiled only ghosts. By lengths he took again to a humble rowboat on the Atlantic swell, riding out with ghillie along the rocky shore behind the house. Most often however, the boat lay becalmed on a fishing lake, a bywater of the River Corrib. Here Bruce Ismay sat for hours, hunched over a rod, alone with his thoughts. Mindful of all that had gone before. The lodge was burnt to the ground by Irregular forces, who called themselves the IRA, during the early 1920s.1 It was a time when stately homes, the trappings of an absentee ascendancy, were everywhere going up in smoke. It is not clear whether Ismay was in occupation at the time, nor whether he had to make another dramatic night escape in his pyjamas. But J. Bruce Ismay would soon be confronted with the charred remains – and would order the lodge rebuilt, brick by soot-smudged brick. The new house was completed by 1925. Thereafter it became his impregnable seat. "In memory of Bruce Ismay, who spent many happy hours here 1913-37. He loved all wild and lonely places, believing that what we see is boundless as we wish our souls to be." His remains were committed to the flames at Putney Vale crematorium. Ironically, one of those listed as attending was a gentleman who signed himself E.J. Smyth, but this was another Edward, a Board of Trade official who once administered at Dublin port. It is said that Florence brought some of her beloved’s ashes back to Connemara and scattered them in the garden. It might have been poetic indeed, if a swirling inshore breeze had caught a single powdered petal and carried it out to sea. In later years his heart was in the wonderful sporting estate which he owned in Galway, with its superb fishing; but keen fisherman as he was, he still had time to spare for the wants of the needy inhabitants of that part of the country, and there must be many there who are sorrowing very greatly at his passing and who will maintain a deeply affectionate memory of "his Honour" for many years to come. And so to the tale of the Lost Will and Testament of Joseph Bruce Ismay. Probated in Liverpool in November that year, it appointed his widow, Julia Florence Ismay, and his sons, Thomas and George Bruce Ismay, as executors. Also made trustee was George Ronald Hamilton Cheape, husband of Ismay’s daughter Margaret. Signatures of executor trustees on the Ismay will. Wife Florence (J. F.) Ismay, who died aged 96 in 1964, signs at the top. Thomas Bruce, Ismay's eldest son, is next, followed by the flourish of George Bruce Ismay, who would die within five years. The last name is that of Ismay's son-in-law, G.R.H. (George Ronald Hamilton) Cheape. Ismay had two sons and two daughters, a substantial brood that is invariably overlooked in potted biographies which seem to invite a belief that he and Florence inhabited a lonely childlessness. Nothing could be further from the truth. Mr Bruce Ismay, who died yesterday at his residence, 15 Hill Street, Mayfair, at the age of 74, was well-known, particularly in Liverpool, as an able ship owner. Born in Liverpool on December 12, 1862, Joseph Bruce Ismay was sent to Elstree and then to Harrow. In his younger days he was fond of Association football and lawn tennis. In 1888 he married Julia Florence, daughter of Mr George R. Schieffelin, of New York. Her sister afterwards married his brother, Mr C.B. Ismay, who died in May, 1924. In business Mr Ismay was accounted an austere man. He was certainly taciturn by nature, but could be a charming host. He had an extraordinary memory; his success was due to his industry, integrity and acumen, qualities which he inherited from his father. Last year Mr Ismay suffered from a serious illness and decided to withdraw from most of his business activities. A few days ago he was again taken ill, and the end came quickly. Mrs Ismay survives him with two sons and two daughters. The younger of the sons, Mr George Bruce Ismay, continues to be associated with North Atlantic shipping through Cunard White Star, Ltd. The elder daughter, Margaret, married Brigadier General Ronald Cheape, and the younger, Evelyn, married Mr Basil Sanderson (a son of the late Mr Harold Sanderson, well known in North Atlantic shipping), who holds various important positions in shipping today. He had an extraordinary memory… and Ismay’s will proves him heedful to the smallest detail, fully in keeping with that ingrained family watchword that encouraged maximum awareness. To his wife Florence, now his widow, Ismay left the prestigious London address at 15 Hill Street, off Berkeley Square. He also willed her my wearing apparel, watches, jewels, trinkets and all other articles of personal use or ornament belonging to me, and my wines, liquors, fuel and consumable household stores and provisions. He added: I give to my wife for her absolute use and benefit all my freehold and leasehold land, fisheries, sporting rights and other property in the County of Galway in Ireland, and all household or domestic furniture, and all boats and their furniture, and tackle fishing appliances, and other effects belonging to me and used or intended to be used in connection therewith. Boats – and the equipping of boats. There is an eerie resonance here, in Ismay’s will, one quarter-century after the world’s most infamous maritime disaster. Florence also benefited from the vast trust fund left to Ismay in turn by his own father, while the trustees would administrate Ismay’s own residual estate for her benefit and that of the offspring. After payment of monumental death duties, that estate was valued at £669,718 net. The portrait of T.H. Ismay by Millais, precious to his son, was given to Florence. Ismay also expressed the intention that it should also pass to his eldest son and lineal descendants as a memorial of his connection with the White Star Line and the Liverpool Seamen’s Pension Fund. * Eldest Son Thomas Bruce Ismay was left the casket in which the Freedom of the City of Belfast was presented to T.H. Ismay, as well as a silver salver left to the testator by his own grandfather. Thomas also received the large gold cigarette case given to Ismay by Florence – and his father’s collection of various lawn tennis prizes. Thomas and his issue were also afforded a preliminary payment of £133,911. * George Bruce was bequeathed Ismay’s jewelled watch and chain, a further wristwatch, the original present of Florence, and the seal formerly used by Ismay’s grandfather. The brothers were also to share their father’s guns, rifles and implements of sport. George also benefited through receipt of a second portrait of Ismay pere, this time by Herkomer. George, his heirs and successors, were paid £125,905 in interim grant. * Daughter Evelyn Constance Sanderson, whose father-in-law, Harold Sanderson, had testified at the British Titanic Inquiry as a director of the White Star Line, was given a number of silver treasures. So too was her sister Margaret, benefiting by two silver centerpieces, one the previous gift of William Imrie, Thomas Henry Ismay’s former partner in the White Star Line. * Margaret Bruce Cheape and her issue were bequeathed the initial sum of £151, 203. Ismay’s brother, James Hainsworth Ismay, a director of the White Star Line, was given a pair of diamond cufflinks. Even the servants were seen right. Butler John Smith was to receive an annuity of £200 for life, Chauffeur William Bungay, a lifelong £100 stipend. 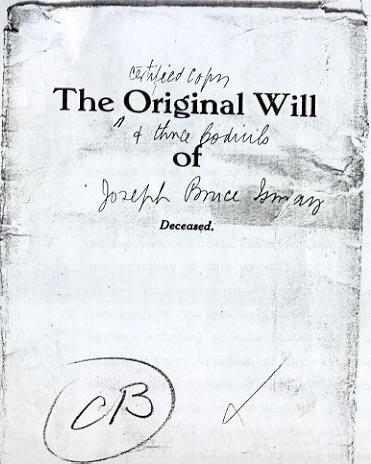 J. Bruce Ismay also made a number of charitable bequests. He left to Florence a sum of £11,000, asking that she pay sums of £2,000 each to five concerns – including the Liverpool Seamen’s Orphan Institution, the Liverpool training ship Indefatigable, the Liverpool Seamen’s Pension Fund, and the Margaret Ismay fund for pensioners’ widows. The National Mercantile Marine Fund started by Bruce Ismay himself in the wake of the Great War through a £25,000 donation, was to similarly benefit. The inscribed ring Bruce Ismay wore while escaping from the Titanic still survives. Lives come and go. The Ismay family is today in eclipse and an American millionaire named Jack Toohey now inhabits Costelloe Lodge. But still the ring reminds its wearer of the dark shadow J. Bruce Ismay carried to the last, until his soul was, as his wife believed, made boundless with the ocean, earth and stars. 1. It has not been possible as yet to establish the exact date of the blaze which gutted Costelloe Lodge during the turbulent nation-birth of modern Ireland, although the incident itself is well attested. "The house was completely destroyed by the fire," says the current owner. Newspaper research has thus far proved fruitless, while police records no longer exist. 2. George Bruce Ismay was serving as a Captain in HM Army when he was killed on April 30, 1943. He left a widow, Dorothy, who lived at 20 Charles Street, Berkeley Square. 3. Ismay's daughter, Margaret, lost her sister-in-law Catherine Beatrice Cheape Cay, in the Empress of Ireland disaster in 1914. I am obliged to Geoff Whitfield for this information.